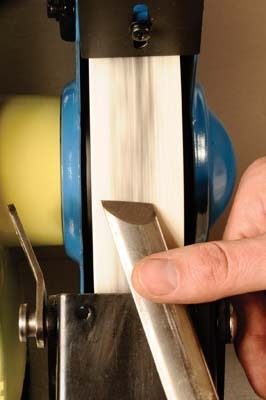 to look at sharpening and safety. 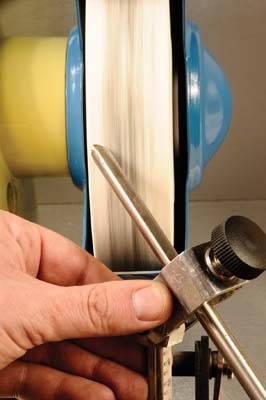 The six basic tool types need different methods of sharpening... and just to confuse matters, the bowl gouge can be sharpened with two different cutting edge profiles, both of which can be done freehand, or with a jig - we'll show you both methods. You will need a standard bench grinder for all these operations and to start off with, you don't need to worry about the coarseness of your stones. 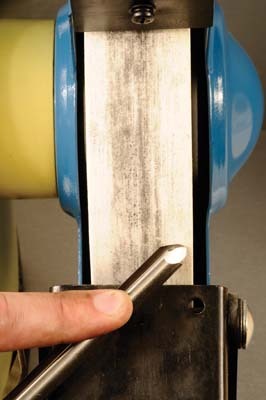 A word of caution, however - some grinders are not compatible with the sharpening jig we'll use later in this article, because their front rest is not removable and would get in the way, so if you plan on using a sharpening jig, buy a compatible grinder. 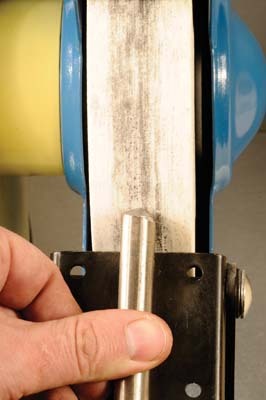 The parting tool is the easiest to sharpen. 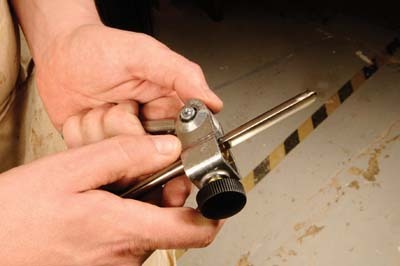 You simply set the tool rest to create the required angle for the parting tool - the inclusive angle can be anything between 30 and 45 degrees. So, with the tool held against the rest, push the tool into the grinding wheel to create a clean grind, then turn over the tool and repeat on the opposite side. 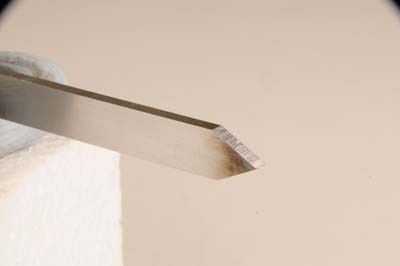 The actual cutting edge is the line created where the two ground faces meet. 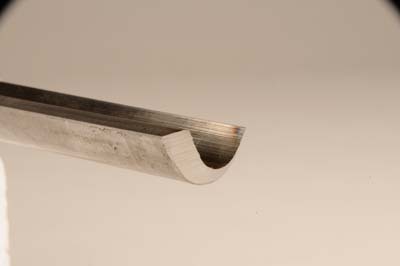 The skew is perhaps the next easiest tool to sharpen, given that you are just grinding a flat on both sides of the tool to create an angled point. 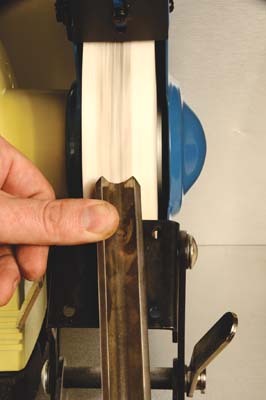 As you can see, the sharpened edge is at an inclusive angle of between 25 and 35 degrees and - when the blade is viewed from the flat side - has a canted rake edge of about 25 degrees, too. 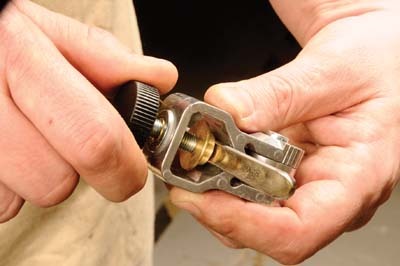 Set your tool guide to the correct angle and grind one side and then an equal amount on the other, to keep the cutting edge in the centre of the tool shaft. to the grinding wheel so one end of the bevel will touch the wheel. 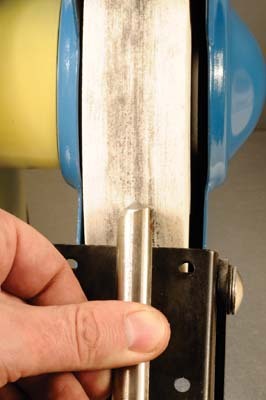 Then push the scraper onto the wheel and sweep it around with your fingers, pressing the tool onto the rest and into the wheel with an even pressure, until the full scraping edge has been sharpened. 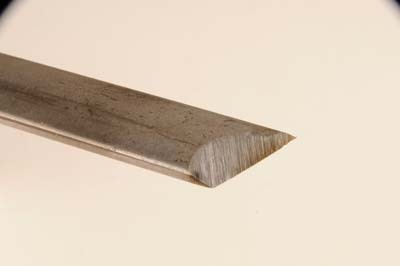 The cut is made by the wire edge created at the intersecting line between the flat top of the scraper and the ground bevel. 2 oâ€™clock, and gently push the tool into the grinding wheel. 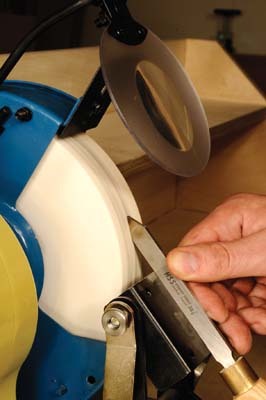 Keep the cutting tool square to the wheel and rotate the tool along its axis to grind the bevel equally across all of the tool cutting edge. 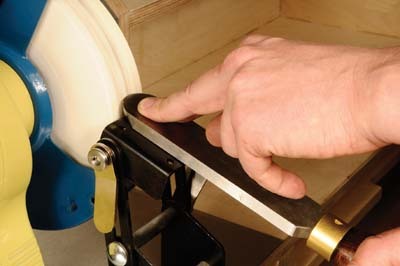 The bowl gouge can take two different kinds of bevel. There's the straight grind, which most tools come ready prepared with, and the swept back profile, often called a fingernail profile. The swept-back profile is now the most commonly used grind on the bowl gouge because it gives more actual cutting edge on the tool than the straight grind, and allows the cutting edge to get into tighter areas because the flute sides - known as wings - are swept back. 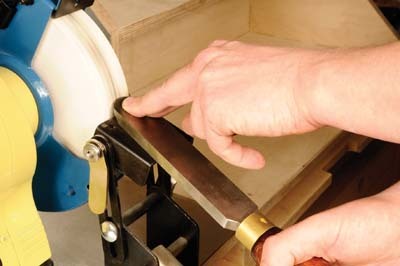 As your turning skills develop, you will find out which grind best suits your turning skills. 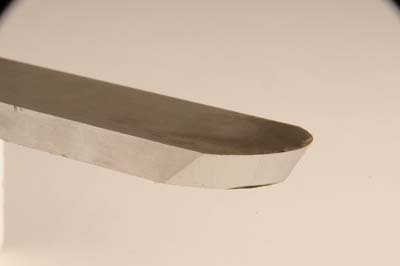 To create the straight grind on this tool, the bevel should have an angle of between 80 & 45 degrees - 45 degrees is a good place to start. 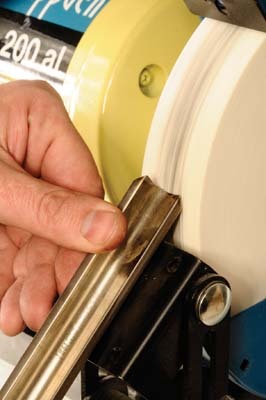 Here, just like for the spindle roughing gouge, the tool is rotated along its axis to grind the bevel. 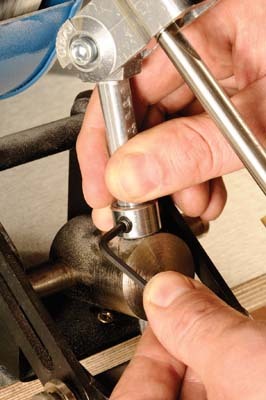 Firstly, set up the tool rest correctly, then with the tool's flute pointing directly to the right, push the tool onto the grinding wheel. 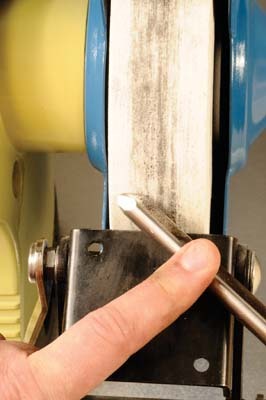 When the grinding wheel bites, turn the tool along its axis so the full face of the tool is ground. Repeat until happy with the result. 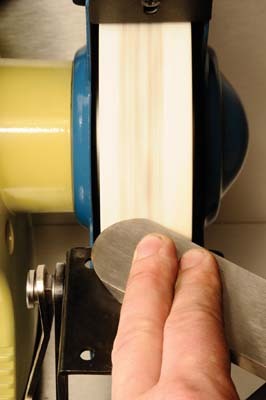 The swept back profile is quite a lot harder to achieve on the bowl gouge, as it involves a swing and rolling motion at the same time. What you are attempting to do with this grind is sweep back the wings of the gouge, giving you more cutting area and easier access to the workpiece. Start off with the flute of the gouge pointing to 2 oâ€™clock and the tool presented to the wheel at an angle of about 45 degrees. Then sweep the tool across the grinder while at the same time, turning the tool along its axis until all the bevel is ground. 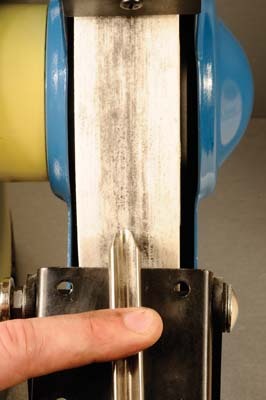 An alternative method of achieving the swept back grind freehand is to cut one wing of the tool, then the other, and then blend in the central part of the gouge. 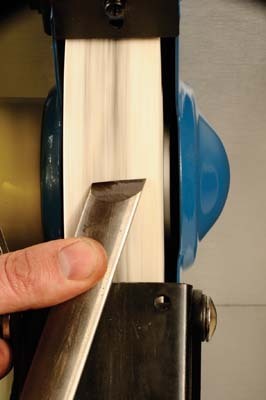 To be honest, the easiest and most consistent way of creating and maintaining this type of grind is to use a jig, discussed on the next page. 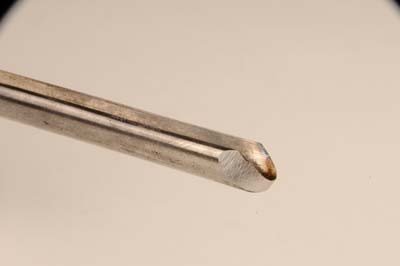 The spindle gouge also takes a swept back profile, sometimes called a lady finger profile. 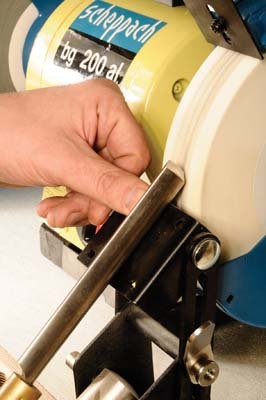 This is achieved in a similar way to the bowl gouge swept-back (or finger nail) profile, outlined on the previous page. The difference in the two profiles is not too obvious, but the spindle gouge tends to have a more pointed outline when viewed from above, looking straight down onto the flute. Again the degree of difference is very much a personal preference and as your turning skills develop, you will naturally find the degree of curvature which suits your turning style. a measuring device to help you work out this angle. Then set the distance the tool will protrude from the clamping device - this will also effect the angle of the bevel you grind. Finally, set the height of the arm between the pivoting joint and the tool holding clamp. 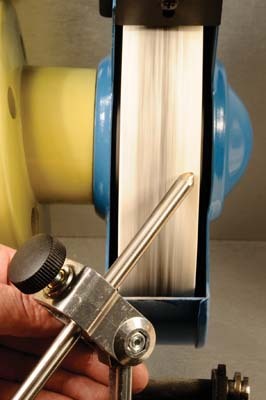 Once these parameters are set, the jig guides you as you sweep the tool across the grinding wheel. 1. 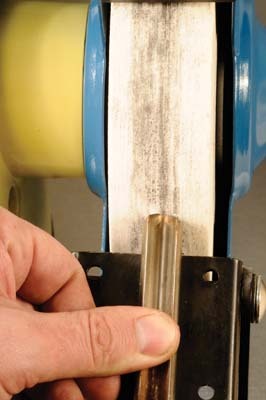 When sharpening on the grinder, take care not to overheat the tool. The first sign of this is the bluing of the blade as it overheats. If it does overheat, do not quench the tool in water, as this can cause micro fractures to occur in the high speed steel used in turning tools. HSS is now the most commonly used steel for turning tools and this is because it offers increased wear resistance over the carbon steel used before. 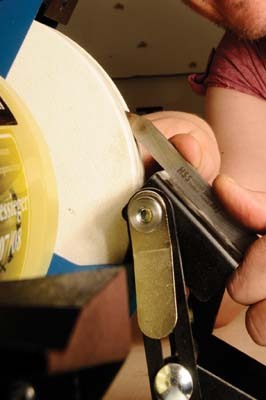 As with all cutting tools, they have to be both hard enough to take an edge, and flexible enough not to snap when in use. 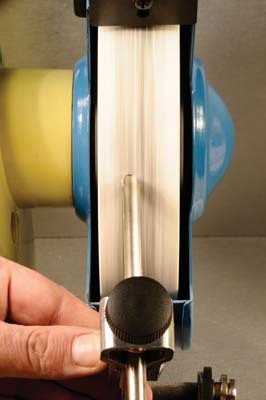 Use the edge of your sharpening bench, or a make a small jig, to mark how far each tool protrudes from the tool clamp, so you can replicate each bevel accurately by using this mark again and again. he first rule of turning safely is knowing how to use the tools and equipment. Turning is a perfectly safe past-time, as long as you know what you are doing. But the combination of a fast-moving workpiece and sharp metal tools needs care. In this series of articles, we hope to have given you all the information you need about using and maintaining your woodturning equipment before you even get near a lathe, that way you should have enough knowledge to start off safely. However, even with the best knowledge and practice, things can go wrong, so it is essential to protect yourself. Even experienced woodturners occasionally have problems. When turning bowls for example, many a turner has caught a tool edge, causing it to dig in, and the workpiece to shatter. Also, even with the best chucking in the world, a workpiece can work loose. To minimise risk, always wear a full face shield. Protecting your eyes and face is essential. a local extraction point, just to make sure. A workshop extraction unit and a hose clamped to the lathe bed are sufficient here. The exception to the above is when turning green timber. 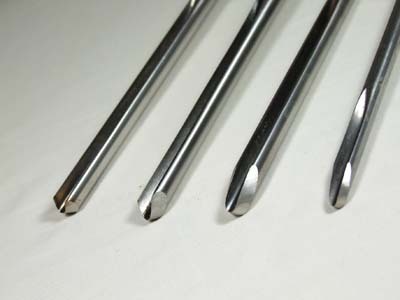 Here, there are so few particles released during turning, extraction is not necessary.